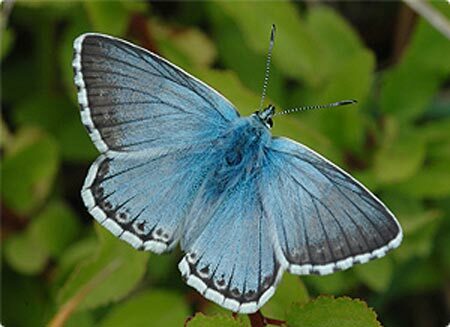 Special features: The wings of the male Chalk-hill blue are a much paler blue than those of the common blue. They appear almost silver-blue with a dark margin. The upper surfaces of the female's wings are brown coloured. The white borders of both male and female wings are chequered with dark lines. The flat green caterpillars feed on horseshoe vetch. They rely on ants on the ground for protection. In return for their protection they release a sugary secretion which is eaten by the ants. Distribution: Found mainly in southern England. Habitat: Chalky fields and meadows. Food: Nectar. The caterpillars feed on horseshoe vetch.